Slate’s “chatterbox” coumn [“Gossip, speculation, and scuttlebutt about politics”] touched briefly on racism charges against Ronald Reagan but largely concerned itself with internal New York Times politics rather than the meat of story. As Slate points out, Times columnist David Brooks indirectly attacked Times columnist Paul Krugman over the latter’s use of what Brooks calls a “slur.” The charge is that Ronald Reagan opened his campaign in Mississippi near where three civil rights workers were killed, and spoke coded appeals to racism by touting “state’s rights.” Brooks even dragged poor “even the liberal Kevin Drum” into his Reagan revisionism. It’s a long way for a sandwhich, and Slate doesn’t really try to discuss the truth or not of Brooks’ “slur” charge. Slate does link to Bob Herbert Times columns which go futher portraying what Reagan was up to. One column mentions Mississippi only in passing, training most of it’s fire on the history of Republican candidates and Bob Jones University. The school still banned interracial dating when compassionate conservative George Bush dropped by in 2000, and a defensive university spokesperson pointed out that it was nothing new. 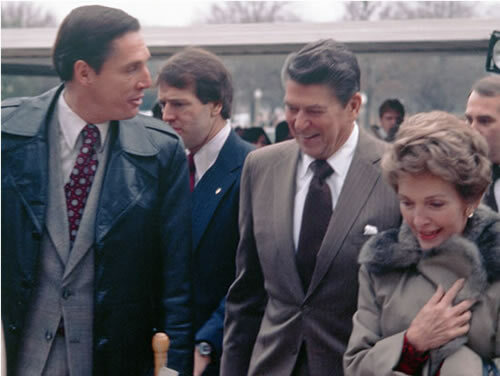 Reagan was there first! He returned the favor once in office, backing the university against the IRS over keeping a tax exempt status while segregated. And Krugman now mentions Bob Jones and a laundry list of Reagan racist moments in his blog. Perhaps the lesson is that limiting yourself to what David Brooks wants to say about the history of Ronald Reagan, Republicans and race won’t get you far. This entry (permalink) was posted on Sunday, November 11th, 2007 at 4:15 PM by mr.president and categorized in AFRICAN AMERICAN HISTORY, AMERICAN HISTORY, AMERICAN PRESIDENTS, HISTORY IN THE NEWS, POLITICAL HUMOR, PRESIDENTIAL HISTORY, PRESIDENTIAL MARKETING, PRESIDENTS OF THE UNITED STATES, RONALD REAGAN, UNITED STATES HISTORY, US PRESIDENTS, WHITE HOUSE HISTORY.